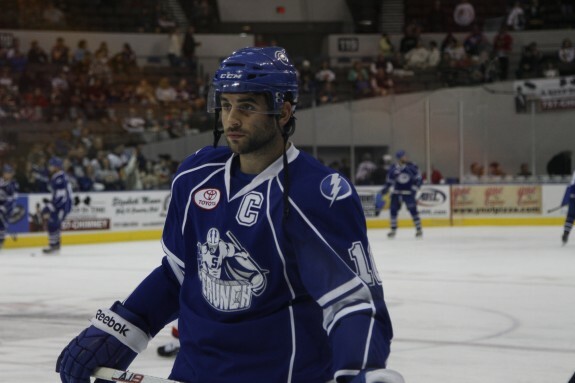 TheHockeyWriters.com recently caught up with the captain of the Syracuse Crunch Mike Angelidis. 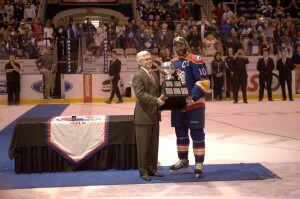 The 29-year-old’s roots as Captain can be traced back to his days with the Norfolk Admirals. The Owen Sound Attack product chatted about maturing as a Captain and more in this exclusive Q&A interview. THW: You’ve been the Captain of the Lighting’s AHL affiliate since 2012 which was the Calder Cup year here in Norfolk. How does it feel to have served as Captain since 2012? M.A. : It’s an honor and a privilege. I think it’s something you have to take with pride and you have to take it everyday as it comes. It’s a challenge and it’s something that’s honorable. It’s something you’ve got to bring every night. You can’t take nights off and you have to play hard every game. I try to lead by example and hopefully guys follow. THW: How has your leadership changed since you first took over the role here in Norfolk during the 2011-2012 season? M.A. : The first year it was a learning curve for me. I tried to make it a family atmosphere. Every year as a Captain you go through different obstacles, different challenges and you have to learn to adapt to them. As I’ve gotten older I’ve learned to stay more positive. I think I’m taking charge more and commanding more respect. I think as you go through things you learn how to deal with different situations. THW: What did you learn your first year as Captain? M.A. : I’ve learned if you make your team more of a family atmosphere you keep guys closer together and you have more opportunity for success. It doesn’t matter how good you are or how bad you are as a team. If you have a tight-knit team and everyone is pushing and pulling for each other you’re creating success for a team. When you have greater success as a team you have greater success as individuals. I think a lot of guys want to succeed individually, but to do that you have to succeed as a team. THW: What makes a great Captain? M.A. : Someone who takes ownership of the team and someone who cares about the guys. I think first and foremost you have to care about your team and you have to play for them. You can’t just put a C on anybody and say “Hey go out there and be the Captain.” You have to care for your team and stick up for them. One thing is that you can’t call a guy out if you’re not willing to do the job. THW: You’re a lead by example type of guy, right? M.A. : Yes, I wouldn’t call anyone out on something that I wouldn’t do. If I’m willing to block a shot, I want other guys to do it. If someone gets hit hard or someone takes liberties on our team I’m willing to stand up, everyone has to stand up. THW: When your team isn’t playing well, how do you get things rolling in the positive direction? M.A. : You try and stay positive. I think guys start feeling sorry for themselves and you can’t do that. You have to come out of this together. When you try and start to do things individually it’s going to get deeper into the hole I think. You’ve got to work hard as a team and you’ve got to do something to spark the team maybe a fight or a hit or a big goal and hopefully that will lift the team to a win. THW: When the team is winning and playing well, how do you keep the positive momentum going? M.A. : Not letting guys take things for granted and slacking, especially in practice and games making sure guys work hard and bring it every night. No one is taking a night off because in this league you can’t do that. THW: How do you rely on your Assistant Captains, and what type of role do they play? M.A. : I really rely on them. We’ve got guys like Mormina, Cote, Neilson and Blunden. These guys are huge leaders for us. We make decisions together. It’s just not a dictatorship or me as Captain and those guys just listen. If they’ve got something to say they say it. We back each other up and we’re a leadership group, it’s just not a Captain or Assistant, they’re Captains too and we’re one. Admirals forward John Kurtz had this to say about Angelidis.